"FATHER, THE HOUR HAS COME." This is the last Sunday before Pentecost and we hear the conclusion of Jesus' farewell sermon at his last supper. Our Gospel reading (John 17:1-11) is an excerpt from what is known as the High Priestly Prayer. Jesus turned his focus from his disciples to the Father in a final conversation to the one who sent him; a loving plea for his disciples and for his Church. Just before Jesus' ascension into heaven (see last Thursday's readings), he told his disciples to return to Jerusalem and wait for the coming of the Holy Spirit. Our first reading (Acts 1:12-14) is the account of the apostles, Mary and other disciples as the gathered in the upper room, to pray and to wait. Next Sunday, we will see that their wait would soon be over. After Jesus had been taken up to heaven the apostles returned to Jerusalem from the mount called Olivet, which is near Jerusalem, a sabbath day's journey away. When they entered the city they went to the upper room where they were staying, Peter and John and James and Andrew, Philip and Thomas, Bartholomew and Matthew, James son of Alphaeus, Simon the Zealot, and Judas son of James. All these devoted themselves with one accord to prayer, together with some women, and Mary the mother of Jesus, and his brothers. In our Epistle reading (1 Peter 4:13-16) we hear that in Jesus, suffering and glory are inextricably linked. And so it is with us, especially those who suffer in the name of Christ. In Christ, our suffering is a cause for rejoicing. Beloved: Rejoice to the extent that you share in the sufferings of Christ, so that when his glory is revealed you may also rejoice exultantly. If you are insulted for the name of Christ, blessed are you, for the Spirit of glory and of God rests upon you. But let no one among you be made to suffer as a murderer, a thief, an evildoer, or as an intriguer. But whoever is made to suffer as a Christian should not be ashamed but glorify God because of the name. 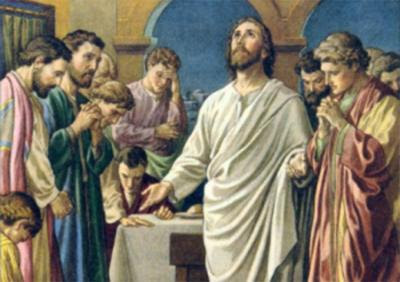 Just as the disciples gathered in the upper room to await the coming of the Holy Spirit, so we await as well. Next Sunday, we celebrate the coming of the Holy Spirit into our world, to be our advocate, teacher and guide who will lead us home to the Father and Jesus. Along that path to home is our own passion and suffering. May we see it as a cause to join with the suffering of Jesus and through our rejoicing, find glory.